Carolee Hazard of Menlo Park is up for a VH1 Do Something Award, which recognizes people around the country who have made a difference in their communities. As has become popular these days, the public is invited to vote among a number of nominees to see who actually gets an award. The winners will be revealed at a taping of the Do Something Awards Show on Aug. 14 at the Hollywood Palladium, to be aired Aug. 18. You may have heard of the 93 Dollar Club, a sort of viral local charity. It was started in 2009 by Hazard after she paid for a stranded stranger’s groceries worth $207 at Trader Joe’s, letting the woman know she could mail Hazard a check later. The woman did mail Hazard a check, plus $93.00, suggesting Hazard get herself a massage. Hazard asked her Facebook friends what to do with the extra money; their response was to give it to charity. She donated the money to Second Harvest Food Bank of Santa Clara and San Mateo Counties, and the 93 Dollar Club was born. Since then more than $120,000 has come into the food bank through the charity as more people learn the story of Hazard’s good deed. When you go to the VH1 site you have to either log in through Facebook, or you have to sign up (free) with the website. It’s a bit of a hassle, but it’s a worthy cause to see a local neighbor be recognized on a national level, potentially raising more money to help those struggling with hunger in the Silicon Valley. Buying a turkey this weekend for your Thanksgiving table? Pick up one ..
Sacred Heart Needs 9,000 Toys; Holiday Donation Drives in Final ..
Last week I reported that Sacred Heart Community Service in San Jose .. 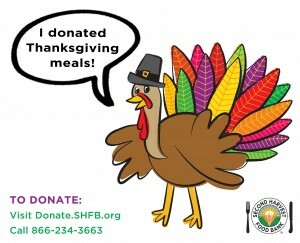 Turkeys and Cash In High Demand by Food Banks, Agencies ..
Thanksgiving is one week away and sadly local food banks and other ..